I do love marmalade. It’s probably among my most favorite of the jam type of offerings. I guess I like it because it’s not too sweet and can have a little bite to it. I certainly do like the homemade variety more than the generic store bought one. There are many ways to make it; however, for my taste I like this recipe the best. 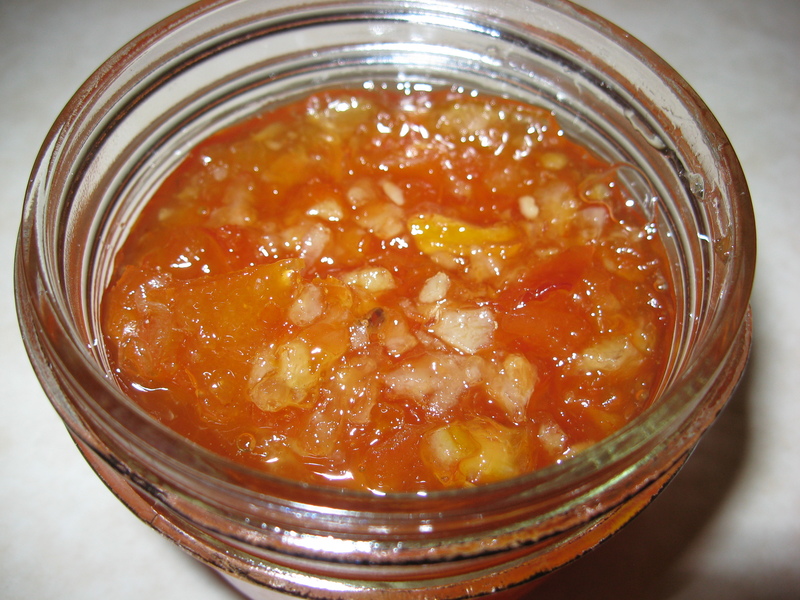 Because of the grapefruit, this marmalade has a little “chew” to it—if you get my drift. Don’t forget that it’s always nice to make some extra for a hostess gift. There’s nothing like a homemade product, I think, to give as a little thank you to someone who cares enough to have you over to theirs. For myself, I particularly enjoy it in the mornings on a toasted English muffin that has peanut butter on it; for desert, I really like it mixed in with some Greek style yogurt. Cut the unpeeled fruit in smaller pieces, deseed if necessary, and put in a blender or osterizer to finish the chopping process. Don’t over chop because you do want some peels to remain. For every cup of chopped fruit, use 1 cup of water. So if you have 5 cups of chopped fruit, which is about what these three will yield, you will use 15 cups of water. Put chopped fruit and water in a large pot and let soak for 12 hours. I sometimes also add 2 or 3 chopped caramelized ginger. Bring the mixture to a boil after the 12 hours and boil (low to medium roll) for 20 minutes. After the 2nd sitting, add 3/4 cup of sugar for every cupful of fruit. So, if you have 3 cups of chopped fruit, you would add 3 3/4 cups of sugar. 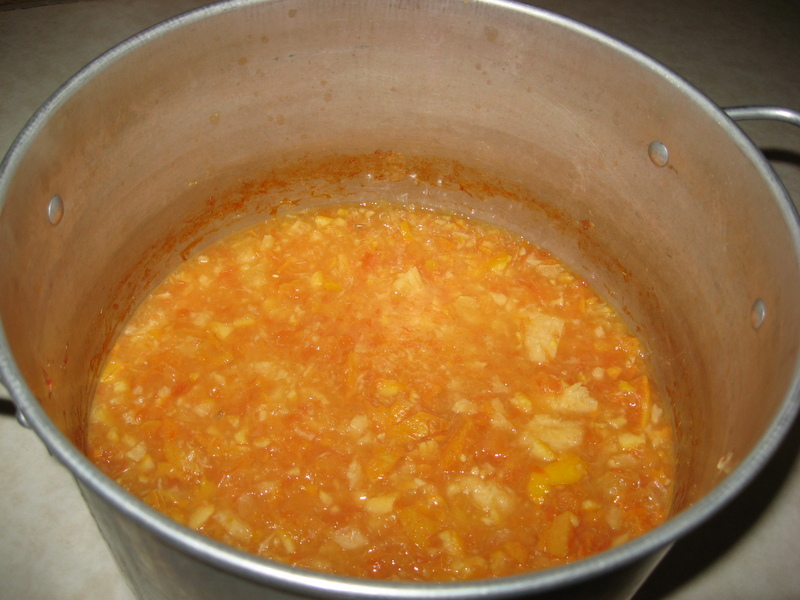 Slow boil until mixture forms a jelly like substance. I take a bit out and put it in the freezer for 5 minutes and see if when it’s cool, it’s the way I like it. Usually this slow boil takes about 35 to 40 minutes. Put in sterilized jars and top with paraffin. Don’t forget to put a bit aside in the frig for you to enjoy.